“How To Get People On Your Opt-In Email List And Get 'Em To Buy Using The Full Arsenal"
"I'm looking forward to putting promotions together the way you do, Marlon!" First of all is the quality of the products you offer - everything you offer is top notch and it does exactly what it says its gonna do. You do a phenomenal job of promoting it, but it's not a bunch of hype. Whatever you say your products are going to do, they actually do. "You lay out the framework — very clearly." And you also make me (and no doubt countless others) acutely aware of exactly which pieces of the puzzle are still missing, triggering thoughts of OMG! That Sell Your Products Like Crazy! You will get wins and results if you use the Promo Dashboard, or I'll give you quadruple your money back. Of course you're always protected by our 100% standard 90 day satisfaction guarantee, which means, for any reason at all you can get your money back. But beyond that we offer your quadruple your money back guarantee if you use the Design Dashboard and you don't get concrete, tangible wins and results. Here's how the Promo Dashboard guarantee works. Click the icons. Follow the steps as presented. I guarantee you will get wins and you will get results. By "wins" I mean, you will get things set up and functioning that you didn't have before. You will get results. Things will start falling in place for you. If you click the icons and on a "best effort" basis, follow the steps. If you don't get tangible wins and results then just show us what you've done and that you made a good effort to follow the steps and we'll give you quadruple your money back. Just show us you followed the steps. Give us your URL's, screen captures and so forth. I'm not asking for perfection on the one hand, on the other hand you do need to show us that you made a conscientious effort to click the icons and follow the steps. The quadruple your money back guarantee is dependant on you following the steps in the Promo Dashboard. If you simply didn't like the product then you'll receive a regular 100% money back refund. I only allow 1 quadruple your money back refund per family, customer, corporation, or entity. In the event of a question of fraud, I will give a money back guarantee, but not a quadruple your money back guarantee. You follow the simple, easy steps. Then you go to icon two. Each day you do one icon. Next thing you know, you've got a Squeeze page that snaps up email addresses like a Venus Flytrap snaps up flies, you have email broadcasts going out, "The Full Arsenal" is in effect and people are buying like crazy. Making money online is NOT complex. You get people on your LIST. You send emails asking 'em to buy. And if that doesn't work, you use blog posts, podcasts, videos, Twitter messages, teleseminars and webinars that ask 'em to buy. Whether you sell your own products or AFFILIATE products, it's all the same process. And in my new Promo Dashboard, I'm gonna walk you step-by-step through how to do these things using both screen caps and video as needed. And even if you think you can't do audio, video, podcasts, blog posts or write emails, I'm gonna show you HOW! What's more, you won't spend a bundle or sweat bullets wading through huge manuals. I'm gonna remove the "learning curve" as much as possible. I'll take the complexity out and make things as simple as possible. It's called point-and-click promotion. And it's destined to become the latest rage to hit Internet marketing. Why? Because you don't have to wade through dozens, hundreds or thousands of pages of information or sit through hundreds of hours of video. Instead, you just click the icons and follow the simple, easy steps. 1. Walks you step-by-step through what to do and how to do it. Every step is clearly laid out and labeled with big, blue numbers and step-by-step screen caps (with support by video as needed). 3. Create Squeeze pages that snag opt-ins like a Venus Flytrap Snaps Up Flies. This isn't rocket science. But it IS absolutely critical to your success. If you don't have an email list or people simply aren't joining yours, I'll reveal "the truth" about what it takes along with REALL LIFE examples of the truth in action. 4. Gives you an A to Z system. You get the the whole ball of wax, starting with targeting your ideal buyer. This is critical because it sets the stage for merchandising your freebie to get opt-in subscribers. Next comes step-by-step instructions on how to create reports, screen capture videos, cd's, and courses to COMPEL people to join your email list. I don't just tell you to do this. I show you how to do it step-by-step. Next comes the web page creation where you set up your Squeeze page, add the header, add autoresponder, fly in ad, and so forth. I refer you to a shortlist of graphic designers who understand Squeeze pages and can create one for you at very reasonable prices. Or, of course, you can create your own using what you learned in Design Dashboard. Of course, I cover registering your domain name, getting a good quality web host (for cheap!) and how to FTP your files! Finally, you learn how to send out emails then funnel people through to podcasts, screen capture videos, live video, teleseminars and blogs that get people to BUY! You won't find anything else like it anywhere. Just about no stone is left unturned. 5. Something for you if you're a beginner or advanced student. My Promo Dashboard was created for beginners. But I've included a few steps for advanced students as well. For example, you'll get the copy-and-paste code that puts people's names in the headline of your sales page when you send out emails. Not to mention the trick podcast players and other goodies I've packed in. 6. How to get people to BUY using "the full arsenal." Once you GET people on your email list, you gotta sell 'em. I'll show you step-by-step how to set up your blog, put up a podcast with a "tricked out" player, create screen capture videos, send Twitter messages and more. 8. Shows you how to "pimp out" your PDF's, podcast players, affiliate tools, video players and Power Points. People get bored if you send out the same ol', same ol' stuff. So I'm gonna empower YOU to have tricked out and hopped up podcasts, videos, PDF's and other tools -- with the end result that people stay on your email list longer, read, listen, participate and BUY. Point-And-Click Web Promotion Is The Newest, Simplest and Easiest Way To Target Your Buyers, Create Magnetic Freebies, Get 'Em On Your List And Sell Like Crazy! Whether you sell your OWN products or you're promoting AFFILIATE products, you still do the same thing. You get people on your email list, then you send out offers. What's different about my new Promo Dashboard is you don't have to read a lot of stuff. You're busy. You're probably dealing with information overload. You have a lot of stuff to do and not enough time to do it in. My goal from day one when I launched The Amazing Formula That Sells Products Like Crazy was to make selling your products and services sell like crazy. And it still is, only right now what I'm doing is showing you step by step how to create a killer Squeeze page then send out email promos that actually convert! By the way, I'm a real person. My office number is (210) 561-1829. That's a real number, not a voice mail. During business hours that's answered by either myself or my team every day. Please call only during weekday business hours 9-5 CST. Anyway, the problem is information overload. There are so many ebooks with so much information on how to make web sites, or videos on what to do, I believe you could spend the rest of your LIFE watching the videos and trying to come up with a feasible Squeeze page from those instructions. Forget all that. Can you point? Can you click? Can you download a simple free software program? Can you follow simple step 1, 2, 3 instructions? Your goal is to create a killer Squeeze page with a freebie on it (like a report, PDF, for ecourse) that compels people to join your list. That way, you can send out emails and make sales, Right? OK then. Let's get your show on the road. 4 Key Differences Separate The Promo Dashboard From Other Solutions! Key Difference #1: You point, click and follow the steps labelled by the big blue numbers -- all in just 30-60 minutes a day. Nothing could be easier. Everything is covered A to Z from html editors to hosting, domain names, ftp, and autoresponders. You get step-by-step screen caps, which are a lot faster than watching tons of tedious, boring videos. Yet, where it would make things faster, I've used videos. It's about speed and ease. You'll need 30-60 minutes a day. Some icons take longer, but you can just split 'em up into multiple days. I'm setting up a Promo Dashboard Forum where members can help other members. That way, if you have a question, you won't be left high and dry. This forum will be available for 60 days, and is a BONUS, so you will want to act promptly to assure you get in. The Promo Dashboard covers ALL the basics as thoroughly as I could. But I wanted to go beyond that with advanced secrets. 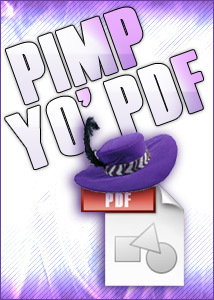 So I've included the scoop on how to PIMP OUT pdf's, Power Points, screen videos, and even your opt-in forms. While some marketers DO these things but REFUSE to teach 'em, I reveal what they won't or don't. This isn't about what a stud I am, how cool my video looks, how pimped out MY PDF's are. It's about empowering YOU to have cool stuff that sells. Cool pdf's, videos, Power Points and podcasts. I call it the Occam's Razor solution. Occam's razor (sometimes spelled Ockham's razor) is a principle attributed to the 14th-century English logician and Franciscan friar, William of Ockham.The principle states that the explanation of any phenomenon should make as few assumptions as possible, eliminating those that make no difference in the observable predictions of the explanatory hypothesis or theory (from Wikopedia). In other words, you focus on the few things that work and eliminate all the other noise. Believe it or not, there are ONLY a couple things that really matter on the Squeeze page and conversion emails. If you aren't getting 15% to 25% of your web site visitors to "opt in" to your list, you're probably missing one very important secret. Of course, the numbers above would be for Google ppc traffic, and it depends on your target market. That said, I take away the smoke and mirrors and apart from the basics (which I teach), there's really only one big key to getting people to opt in to your list. If you have a Squeeze page and people aren't opting in, chances are this is the reason why. I have a little collection of Squeeze pages that are totally hot for various reasons. I take you on a tour of these pages and explain how and why they rock. Some of these are NOT "brand name" Squeeze pages. But they exemplify everything I teach and believe in. Your mind will RACE with ideas as you see these rockin' pages. Promo Dashboard picks up where Traffic Secrets, Mass Control and Wholesale Traffic leave off. So it's a perfect add-on to them. Mass Control tells you send out "money magnets." Now, Promo Dashboard shows you HOW to create the PDF's, screen capture videos and live videos, just like Frank brilliantly demonstrates. And Product Launch Formula? 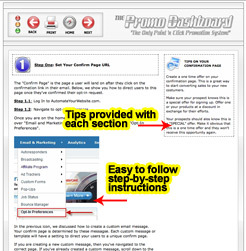 You need PDF's, blogs, screen video and email broadcasts to implement it. So Promo Dashboard is the perfect add-on for ALL Product Launch Formula buyers. Mass Control, Product Launch Formula and Traffic Secrets won't do you ANY good if you don't know how to send emails, how to create, upload and LINK to PDF's, how to create and upload podcasts and how to set up a blog. But with Promo Dashboard in gear, you'll be ready to make those systems rock and roll! Step by step - exactly how to employ "The Full Arsenal" and get 10% of your opt-in list to buy. Of course, it depends on your target market, source of your names, price points and all that jazz. But if you're selling something that is an inexpensive purchase for your target buyers and getting LESS than 10% to purchase, I BET you're leaving out this ONE key element. And you know what? Take away all the hocus pocus and phoney baloney and THIS is the one thing (the Occam's Razor) that REALLY gets people to buy. Plain and simple. No smoke. No mirrors. Just clarity at last. Where To Get Sales Letters Written For $120.00 USD That Actually Convert! My friend Keith Baxter is a highly experienced, veteran marketer. But on certain projects, he doesn't want to use his "big guns" copywriter at a price of $10,000. So he has a neato trick I NEVER thought of for hiring copywriters for $120. And Keith says their copy converts! You can hear Keith tell it himself on a BONUS audio I'll be sending out later in my launch. If you're in from day one, you'll snag yourself a copy when I release it. I'm a BIG believer in learning to write your own copy. But if you're a newbie or just struggling to get the hang of it, I 100% think you should try this creative method. I HATE learning curves on software. You can muck around a whole day or two and STILL not have things figured out correctly. That's why I made SURE we included good tutorials on creating screen capture video. Camtasia is what I use for my screen capture video. But if you're on a limited budget, you can use CamStudio for free. Consuming "how to" information products is great. But the MONEY (as well as the fun and excitement) is in playing the Game. You enter the Game when you become a producer and a promoter. Either you produce and promote your OWN products or you promote other people's products as an affiliate. Either way, Promo Dashboard is there guiding you every step of the way. This is absolutely critical. How can you hit a target if you don't know where it is or what it looks like? So I show you step-by-step how to put together an actual Target Buyer profile based on accurate research. 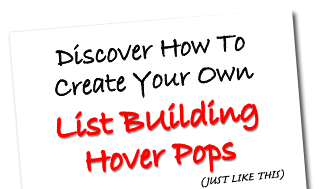 I show you exactly how to find the blogs your target buyers read, the web sites they go to and the forums they visit. Then, I'll show you how to find out their income level, age and education status. Using this data, you'll craft a precise target buyer profile, so you can zero in with your marketing. What's more, by doing this, you'll find out WHERE you can buy ads to promote your freebie offer, how much they'll cost and WHO owns the lists (your potential affiiates). In other words, while the Promo Dashboard does NOT cover traffic, it does lay the groundwork for getting it. It's VERY easy to save a video as 50 mb instead of 8 mb if you don't know the right settings. And this makes ALL the difference in the world in how fast your video streams to overseas customers as well as how much bandwidth you use on your web host. Most newbies and a lot of intermediate marketer will totally use the wrong settings to save their Camtasia videos and end up with bloated file sizes, and herky jerky, slow-playing videos. This is a cool trick. It's a line you simple "copy-and-paste." And when people opt-in to your list, it'll pass their first name to the NEXT page, so you can insert it in BIG letters in the headline or text. You can also send out emails that pass their name through to the landing page. Step by step - exactly where to get and use tricked out podcast players no one else seems to know about or use. Some of these are FREE and some are inexpensive ($50 or less). But all beat the pants off those WORN OUT players everyone else uses. Teleconference calls are a GREAT way to get people on your email list to buy. They're part of what I call "the full arsenal." You offer a free call then tell your story and do a little pitch. But the learning curve can be significant. So we did a whole icon that shows you how we do our VOICE BLASTS before the call to make sure people know about it, how we set up the confirmation page. How to use the conference call service. How to record the calls. Just sending straight emails all the time will LOSE the attention of your target audience. So you can keep 'em paying attention by mixing in video. It's NOT how photogenic you are. What matters to your target buyers is if you come across as authentic and sincere. If you can do that, there's a good chance you can use video to your advantage. This icon is a basic intro to doing your own video with links to several inexpensive dvd's that give you the whole lowdown on lighting, greenscreen and everything else. I talk about cameras, the basics of lighting and give you enough info to get started. I have a short-list of designers. They know Internet marketing and will do work for you without asking for a kidney in return. You'll need to hire a designer to create your Squeeze page (unless you own Design Dashboard). How To Get Your Wordpress Blog Up, Running & Pimped Out! Setting up a blog can be a pain. So I had Danny, my graphic designer, create a really cool tutorial that shows you exactly how to set up your blog, install your plug-ins, the whole nine yards. Oh, the reason I had HIM do it is he shows you how to upload your own custom header graphic. Of course, you'll wanna use one of my recommended graphic designers to get your header done (or follow the instructions in Design Dashboard). The biggest thing I hear from newbies is you don't know how to set up your web hosting or ftp your pages. I know one guy who has joined THREE big ticket coaching programs and STILL can't ftp a web page! Well, that ends here. 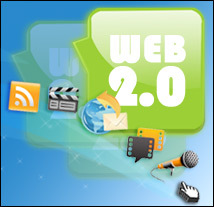 You'll FINALLY know how to set up your web hosting and your blog and ftp pages. And, if you run into any troubles, you can post in our Promo Dashboard Forum (available for 60 days after purchase if you respond in time). A KILLER way to add extra ummmppphhh to your follow up emails is to send 'em to an online video. All you do is whip out PowerPoint (or the free "Impress" program in Open Office) and record your presentation using Camtasia, Camstudio (free) or ScreenFlow (Mac). Screen capture video is an ESSENTIAL tool in your Promo Power Kit. However, those boring stock backgrounds do NOTHING for your sales. And companies charge $100's for already made PowerPoint backgrounds. And most of 'em look totally lackluster. I'll show you how to snag dozens of pictures for $1-$2 each that make drop dead Power Point backgrounds. THESE are what you use in your screen capture videos to GRAB your potential customer's attention. TV's, computer monitors, whiteboards, and all kinds of other creative backgrounds can be simply and easily modified to work in PowerPoint. Drop in bullet points. Fire up Camtasia or Camstudio and you're off and running. How To Add Webinars To Your "Full Arsenal"
If you wanna convert 10% of your opt-in list to buyers, you don't hold anything back. One of the tools that works especially well for your big ticket back-end sale is webinars. I take away the learning curve and give you the essential "need-to- know" info. Podcasts are part of "the full arsenal" for turning your opt-in list into buyers. Not only that, but you can submit'em to podcast directories and get TRAFFIC to your freebie Squeeze page. 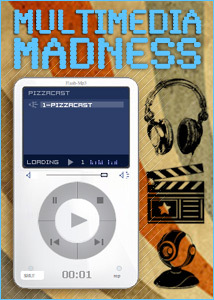 Do you know how much I paid for the sotware we edited our "pizza cast" with? Zero! That's right. And it works on PC's and Macs. Did you know you can click ONE button and add resonance to your voice, so you sound like a million bucks? Did you know you can EASILY cut out your ummms, aaaawwwwwzzzz and pauses? You can even add those pro-sounding intro and exit audio clips. I reveal WHAT this software program is. I call it "secret" because I'd never even heard of it until one of my team members showed it to me. Then, I'll give you a URL you can go to for free tutorials. The one catch is, while a free trial is available, to buy it costs $299 to $1,000, depending on what software you already own. You do NOT NEED this software to follow my methods. It's an "advanced" secret some of my customers can profit from. Imagine this. It's Wed. at 12 noon. Your prospects call in for a free conference call (one of your freebies in your Venus Flytrap. 49 people call in. They're personally greeted by a polite receptionist. Then, at the scheduled time, the call begins. There you are pitching and selling. Five people buy for a 10% conversion rate. Now, NEXT Wed. at 12 noon ANOTHER call on a different topic happens. Same drill. Another 10%. This goes on week after week. The catch? YOU NEVER SHOW UP! The callers are greeted by a LIVE person (that costs you $10 total per call). The call plays a RECORDING you do only time. The whole entire thing is automated. Sound sweet? The name of the service that'll do this for you at reasonable prices is in Promo Dashboard. How to capture customer email addresses. Internet Marketing Into A "No-Brainer"
Each icon on my new Promo Dashboard links to a set of steps that are clearly labeled with big blue numbers. I'm hoping that BY NOW you realize my new Promo Dashboard is worth every penny of the one time low price -- and more. The Promo Dashboard Is Worth Much More! Right now you can grab the Promo Dashboard for the ridiculously low price of $59.95, but I do plan to raise the price very soon. While that may seem like a lot to some people, just one idea, trick or secret promo technique could easily pay for it. I can't possibly even tell you exactly how much time, energy and research we've put into creating the Dashboard over the last four months, but a good estimate is at least $15,000 in salary to my staff, outsourcers and my own personal time. PROOF OF BIG SAVINGS: The Promo Dashboard doesn't COST you money. It literally saves you a small fortune. Let's say you create a screen capture video pitch but don't optimize it correctly. So the file size is 50 mb instead of 8 mb. How many sales do you lose because people don't wait for it to load? If you lose ONE sale, you paid for the Dashboard. What about your flash audio buttons? You can easily pay $30 a month for an audio service. I'll show you how to buy a program for under $100 and save all those monthly fees. What if you're getting 1/2 the opt-ins you COULD be getting with the right method. How many sales does that cost you in a week? A month? A year? By Getting The Promo Dashboard? "That's Hot!" Pimped Out PDF's "That's Not"
Do You Wanna Be Impressed Or Empowered? So to summarize - for $59.95 you can get the Promo Dashboard (or $79 if you want the Promo Dashboard with the add-on pack) and get a system that'll empower you to get opt-ins, send promos and make sales. Not to mention the time you save using the Promo Dashboard and the total convenience of having everything right in front of you, where you need it, when you need it! Sure, you can hire someone to do the marketing for your web site, but do you really want to pay $300, $500, $1,000 or more per week or month? And they probably STILL wouldn't get you 15%-25% opt-ins on your Squeeze page, their emails STILL probably wouldn't convert, and they SURE wouldn't implement "The Full Arsenal" for you! You can also spend $1,000's of dollars on coaching programs, Masterminds and private sites and STILL not know how to ftp, how to pimp out your PDF's, how to have tricked out podcast players everyone else envies and how to convert 10% of your opt-in list to real world buyers. You pay thousands and end up with a hatful of good-sounding theory, FEW opt-ins, glazed over eyes, no pdf's that are trick, no podcasts that rock, no videos that sell. But boy are you ever impressed! Even if you didn't increase your opt-in rate or conversions, even if all you did was reduce your learning curve on how to do PDF's, podcasts, blogs, email broadcasts, Squeeze pages, webinars, cd's, teleseminars, streaming video and Twitter, it'd be worth it. One: The Promo Dashboard with the point-and-click Promo system that turns getting opt-ins and sales into a virtual no-brainer. Two: Five bonuses that make promoting your products faster, simpler and easier than ever before. Three: You get step-by-step instructions on 36 different promotion specifics, all including visual "step one do this, step two do that" screen captures and videos. Many other products on how to promote are all videos, but the Promo Dashboard relies mostly on step-by step-numbers with screen caps because we find they are a lot faster and easier to follow. Of course, since some things just can't be easily shown with screen caps, we did support them with videos. You can stay right on track every step of the way with the written text and screen captures. Four: The main thing is you follow the steps, you will get your freebie, Squeeze page and "Full Arsenal" in action. It's inevitable! Just follow step 1.1, and do what you see on the page. Then go to step 1.2, 1.3 and so on. As you go through the steps, right in front of your eyes you'll see your promo system coming to life! At the end of the day, people will go to your opt-in page, see your hot freebie, join your list, then get email promos that send 'em to podcasts, blog posts, screen capture video, webinars and teleseminars (The Full Arsenal) that get 'em to buy. Five: The associate program pays out 70% commission. Make 2 sales and your copy of the Web Design Dashboard is virtually free. Plus - you can earn up to 100% commission! The Promo Dashboard isn't perfect. I won't be teaching you every trick in the book for Squeeze pages nor how to get traffic. I won't provide free software support and be your answer machine for any design or software question you have. 1. You WILL get better results than you would've gotten without the Promo Dashboard. 2. You WILL get more opt-ins than you would without Promo Dashboard. 3. You will NOT be scratching your head wondering what your plan is. You'll know what you're going to do and what day you're going to do it on. 4. You WILL convert more opt-in prospects to buyers than you would've without the Promo Dashboard. If for any reason you're not 100% thrilled and delighted with the Promo Dashboard, we'll give you every PENNY of your money back. That's how confident I am that you'll love the Promo Dashboard. I rocked the Internet world when I offered a triple-your-money-back guarantee on The Amazing Formula. Now, it's even crazier. I'm offering a QUADRUPLE your money back guarantee. Take the Dashboard. Follow the icons. If it doesn't work for you, then I'll give you quadruple-your-money back anytime in the 3 months following your order. That's how confident I am you will love the Dashboard. Read the details here. To get you off to a really fast start with the Promo Dashboard, I'm holding two quickstart calls. The date is August 26th and September 2nd. I've only got 100 seats available per call. So I urge you to order immediately to make sure you get in on the conference calls. Here's the catch: These bonuses are only available to you if you promise to tell 5 of your friends about the Promo Dashboard. I actually call this my "advertising bonus". I need your help in advertising the product. In exchange for your commitment (assuming you're satisfied with the product) to tell 5 of your friends about the Promo Dashboard, I'm willing to give you this very valuable 5 bonus pack that I think is going to absolutely blow you away! I'm opening a special Promo Dashboard forum just for my customers. That way, members can help each other. And you won't have to worry what you'll do if you get stuck on a point or have a question. This forum will be active for 60 days. I sat down with both Photoshop Elements and Photoshop and showed step-by-step how create tricked out graphics for your PDF's. What's more, this is a GREAT introduction to using Photoshop Elements and Photoshop. Photoshop is a POWER tool and I think one I personally show you how simple and easy it is to use, you'll get hooked! How To Pimp Out Your Podcast Pages! See that mp3 player on the right? I'll show you were to buy it for $40. Other totally cool ones are available for free or cheap. Plus, I'm gonna show you how to add PICTURES to your podcast just like you see in the pizza cast. Your prospects get BORED with emails. So wake 'em up with tricked out podcast players, pictures and pages. It's fun! 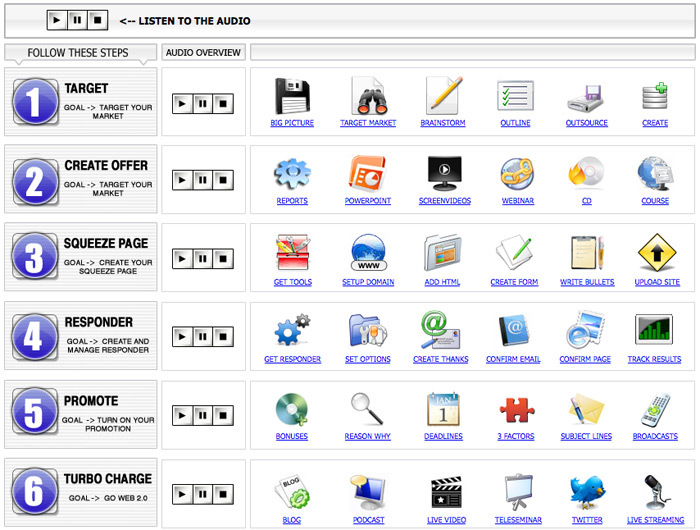 The Promo Dashboard is accessed 100% online, thus it works for both Macs and PC's. Now, the Promo Dashboard is NOT software. To implement certain parts of Promo Dashboard requires free and sometimes "for fee" software. 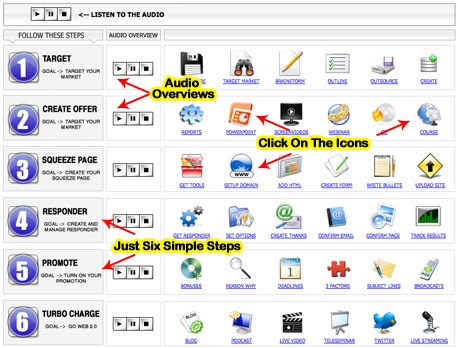 The Promo Dashboard is a point and click, step-by-step learning system with screen captures, supported by videos. And you'll get INSTANT access. To order the Promo Dashboard just click the link below. You can pay using any major credit card, e-check, or from your PayPal account balance. 15-minute behind-the-scenes footage of our upsell video shoot, including how we built the lighting for under $200. These videos didn't fit in the product but pack big value. Banners in forums are a cheap and inexpensive way to promote your freebie offer. Split testing is how you boost the results of your Squeeze pages (you'll get to see my actual numbers). Conversion Prophet is a promising new software we're trying out and think you'll be fascinated by. And the behind-the-scenes footage of our upsell video shoot will show you how to create and set up lighting the right way for "green screen" video. If you need help ordering just click the LIVE HELP link at the top of this page and we'll help you out by live chat. Or you can post a message to us if it's after hours and live chat is offline. P.S. If you've decided not to order, click the play button below.